Aristo-tec supplies and provides an extensive range of industrial compression springs for almost evey industrial application or assembly required. Compression springs are used to resist compression force or to store energy in the push mode. 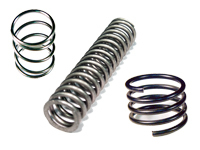 A compression spring describes the action of the spring thus Compression referes to the spring becoming shorter when a load is applied to the spring or compress the spring. There are even more sub-types of industrial compression springs including barrel compression springs, conical or cone shaped compression springs and straight compression springs. In order to supply our customers with the right industrial compression spring, Aristo-tec has created an interactive spring quote request form to identify the design requirements for your spring. © 2006 - Aristo-Tec, Inc.